Rhodium plating is all about silver jewelry, right? You can have Stainless steel jewelry with Rhodium plating. Many people picture a bright, expensive Rhodium finish jewelry only as silver jewelry. It must be expensive to reach this look as you must use silver to craft the jewelry before you can apply rhodium plating. Yes, rhodium is still needed. Like anything in life, you get out of your jewelry what you put in. However, you don’t have to use expensive silver in order to get this sparkling luxury jewelry look. You can upgrade your stainless steel jewelry with Rhodium plating. The color will be bright (whiter than steel), it will look expensive and it is easy to fit into your production schedule. You can plate chains, rings pendents, basically any type of steel jewelry. Let’s find out what Stainless steel jewelry with Rhodium plating is all about. The process of applying rhodium plating on steel jewelry is little different from applying Rhodium on silver jewelry. The process involve 3 steps that can perform in different quality level (we outline our recommended spec below) but one thing you must consider. The plating process does not cover any imperfection. Your steel jewelry must be clean, perfectly polished without marks before the plating. Production steps for Stainless steel jewelry with Rhodium plating. How we plate steel jewelry with rhodium? After polishing, assembly and quality check each piece of jewelry clean and prepare for plating. In the first stage the steel jewelry socked in liquid solutions and plated with 24K gold. The gold layer use as a “glue” between the other 2 layers and the stainless steel. You must make sure the plating is dense enough and cover the whole item in order to insure high durability finished jewelry. After the jewel is plated with 24K gold cleaned and dry it’s time for the 2nd layer. This layer can use different metals combination according to your budget and desired quality. PCP: Palladium and Cobalt mix plating. PNP: Palladium and Nickel mix plating. Next, for the 3rd layer we will apply and plate the entire surface with pure Rhodium. 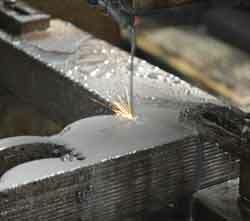 It is possible to apply different thicknesses of rhodium according to the spec. The quality of this layer will have an impact on the color and the shines of your final jewelry piece. How we test Stainless steel jewelry with Rhodium plating? The method is very similar to testing other steel jewelry plating techniques like PVD. The testing performed by a fully automated X-ray machine (imported from Germany). Because the thickness of each layer is very thin, we will perform 10 testing attempt to get the most accurate results. hard copy result’s report available to our customers. Recommended specs for Stainless steel jewelry with Rhodium plating. Mix of 10% Cobalt and 90% Palladium for 2nd layer plating. When you are planning your next steel jewelry production, remember that your plating specs affects the cost and durability of the jewelry and adjust accordingly. This entry was posted in Fabrication methods and tagged Fabrication methods, stainless steel jewelry, steel jewelry factory on April 5, 2015 by Jacob H.. Toxic substances in stainless steel jewelry , international standards. I’ve seen a lot of arguments back and forth on the issue of toxic substances in stainless steel and fashion jewelry, and one thing that really jumps out at me is how much confusion and misunderstanding there is regarding what the standards related to jewelry really mean. This is an attempt to clear up some of the confusion including simple instruction and up to date jewelry lab report examples. High metal contamination in low-cost jewelry is a widespread problem. While the U.S. and Canadian legislation put emphasis on lead exposure prevention, other toxic elements like cadmium in jewelry are not regulated except in paint and coatings. After much discussion and consultation the European Commission has completed amendments to Annex XVII of Regulation1907/2006 (REACH), and published an Updated as on February 2016. What regulations do we follow? We at Hulpf jewelry follow the European Regulation and the REACH Annex XVII in specific as the EU legislation regarding Toxic substances in stainless steel jewelry is more comprehensive and updated. What substances related to steel jewelry we test for? Where do we test for Toxic substances in stainless steel jewelry ? There are numerous independent internationally recognized labs and organization. We use SGS to test for toxic substances in stainless steel jewelry that we manufacture. What the regulations mean to me as a customer? Lead and its compounds in jewelry. Section 63, Annex XVII of REACH will restrict the concentration of lead to 0.05% by weight. This will apply to any individual part of stainless steel jewelry articles, imitation jewelry, fashion jewelry, and hair accessories, including bracelets, necklaces and rings; piercing jewelry, wristwatches and wrist-wear; brooches and cufflinks. Shall not be placed on the market or used in any individual part of jewelry articles if the concentration of lead (expressed as metal) in such a part is equal to or greater than 0.05 % by weight. (ii) “Any individual part” shall include the materials from which the jewellery is made, as well as the individual components of the jewellery articles. Section 23, Annex XVII of REACH will restrict the concentration of Cadmium to 0.01% by weight. This will apply to any individual components and assembled stainless steel and fashion jewelry articles. 23. 7440-43-9 231-152-8 Cadmium and its compounds. (ii) Metal parts of jewellery and imitation jewellery articles and hair accessories, including: bracelets, necklaces and rings, piercing jewellery, wrist-watches and wrist-wear, brooches and cufflinks. Nickel and its compounds may pierce the skin and cause allergic contact dermatitis. The EU Directive 2004/96/EC was issued on 27 September 2004 to restrict the use of nickel in consumer products that may have contact with skin such as buttons, fashion jewelry, sunglasses and belt buckles. After REACH took into force, the directive was replaced by the Regulation (EC) No. 1907/2006 (REACH). Nickel release was then added to the REACH Annex XVII – REACH Restriction List. The Requirements of REACH Restriction are for the release of the nickel in a given time and not the absolute content. There are 2 main jewelry categories. Articles that intend to pierce the human body for example ear studs and should release less than 0.2 µg/cm 2/week. Articles that intend to come into direct contact with the human skin should release less than 0.5 µg/cm 2/week. skin such as: earrings, necklaces, bracelets and chains, anklets, finger rings, wrist-watch cases, watch straps and lighteners, rivet buttons, lighteners, rivets, zippers and metal marks, when these are used in garments, If the rate of nickel release from the parts of these articles coming into direct and prolonged contact with the skin is greater than 0,5 µg/cm2 / week. AZO dyes are the name of the group of synthetic dyestuffs based on nitrogen that are often used in textile industry. Some AZO dye stuffs may separate under certain conditions to produce carcinogenic and allergenic aromatic amines. Since Annex XVII of REACH came into force in 2009, the AZO Directive 2002/61/EC has been replaced by REACH regulation. AZO dyes are put on REACH Restriction List. Leather and textile components in jewelry articles made of colored leather or other synthetic materials should contain less than 30 mg/kg. 2. Azodyes, which are contained in Appendix 9, ‘List of azodyes’, shall not be placed on the market or used for colouring textile and leather articles as a substance or constituent of mixtures in concentrations higher than 0,1 % by mass. How jewelry test reports look like? This jewelry custom project involved different types of materials and components that related to all the above substances we mentioned in this post. For one of the bracelets we use synthetic colored polyester and we test for 22 different AZO dyes. In this bracelet AZO test report you can notice that the limits allowed is 30mg/kg and the result shows that none of the substances were deducted. The silver color bracelet made of Brass and was tested for Cadmium content. In this bracelet Cadmium test report the results show content of 26mg/kg which is below the limit defined by REACH Annex 0.1% or 100 mg/kg. For lead content test we choose to test several beads from the same jewelry project. The test report shows content of 22mg/kg much below the limit of 0.5% allowed by the EU regulation for stainless steel or fashion jewelry. For the nickel release test we choose different beads from the same project. This Nickel release report shows that the beads release less than the 0.5 µg/cm 2/week the max allowed rate for jewelry that come into direct contact with the human skin. I hope that in this post I was able to clear some of the confusion surrounding REACH regulations and make toxic substances in production of stainless steel and fashion jewelry easier to understand. This entry was posted in Stainless steel jewelry info and tagged stainless steel jewelry, steel jewelry factory, steel jewelry manufacturer on September 2, 2013 by Jacob H.. Stainless steel jewelry is made of a steel alloy that contains minimum of 10.5% chromium and less than 1.2% Carbon content. The advantage is that it doesn’t corrode or rust. Although it is also very durable, steel jewelry may get scratched and stained. Bellow some simple rules to keep your stainless steel jewelry in good condition. 1. Pour some warm water in a little bowl, and add some mild dish-washing or window-cleaning liquid. 2. Dip a soft, lint-free fabric in the soapy water, and then gently wipe the stainless steel jewelry with the damp fabric til the piece is clean. Once cleaning it, rub the jewelry along its polish lines. 3. Wipe the remaining soap off your jewelry using a wet fabric dipped in clean water. 4. Dry the jewelry well with a clean towel, and then leave your pieces to air dry. After your stainless steel jewelry is cleaned, you will be able to use a jewelry polish or a polishing cloth to shine it. Some people use toothpaste to clean the especially dirty spots of their stainless steel jewelries. Keep in mind, however, that toothpaste is abrasive. If you decide to use it for cleaning, make sure it is a non-whitening brand that does not contain silica, and use a soft cloth to rub the paste onto your pieces. Don’t forget to rinse the jewelry thoroughly after you are done. An alternative to these cleaning methods is to purchase a stainless steel cleaner from the store and follow the instructions on the package. Although stainless steel jewelry doesn’t tarnish or corrode and doesn’t need special care, it will scratch. That’s why you should wear and store your pieces in a way to minimizes any contact with other items that can damage your stainless steel jewelry. If your jewelry does get scratched, you can always have it professionally polished by a jeweler. Store your stainless steel pieces individually from jewelry made of other metals. It is best if you retain your stainless steel jewelry in individual bags or pouches. This entry was posted in Stainless steel jewelry info and tagged stainless steel jewelry, Stainless steel jewelry private label., steel jewelry factory, steel jewelry manufacturer on May 2, 2013 by Hulpf Team.